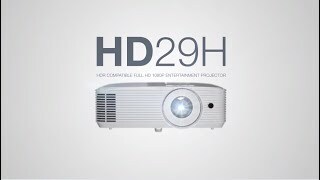 Optoma’s HD29H is comfortably the best gaming projector I’ve ever used. The HD29H delivers a crisp image – that can be up to 300 inches across the diagonal – and is even bright enough to cope with a moderately lit room too. In pitch black surrounds though games truly pop. The vibrant colours of Trials Rising are magnificent at such scale, and the 120Hz refresh rate means that even at pace it still looks great. Optoma HD29H makes for an incredible big-screen gaming experience. The colours are vibrant, the motion smooth, and the image beautifully detailed. Good surprise, versatile projector perfect for gaming and films.An award should be created specifically for this projector.